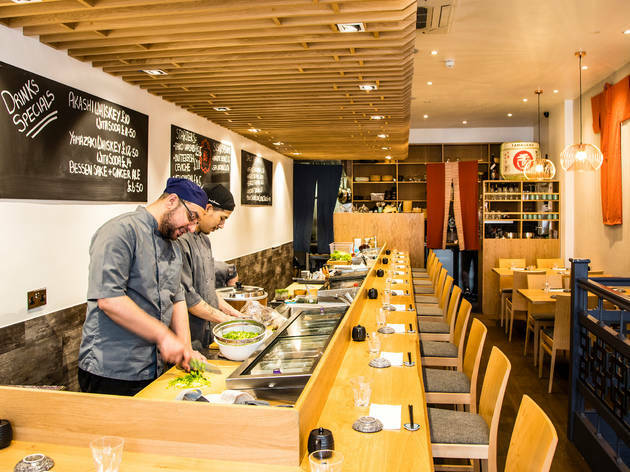 A Fitzrovia sushi joint from the people behind Chisou. The best of both worlds. It’s one of those icky clichés, right up there with blissful ignorance, blind love and greener grass. 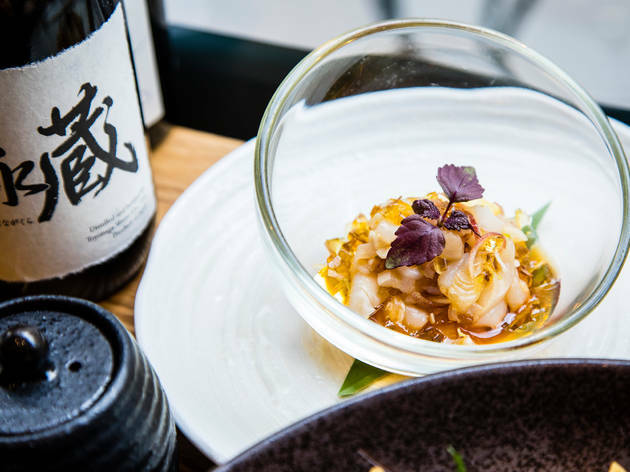 But to describe this Fitzrovia spot, from the people behind the Chisou sushi bars, nothing else will do. Because as I first walk in, it feels old-school. The street-level room is dominated by a brightly lit counter. A line of chefs look up, perilously sharp knives in their hands, and cry out ‘Irrashaimase!’ (welcome!). 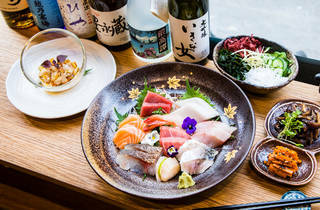 One of the menus offers a traditional omakase (‘chef’s selection’). But take a moment, peel back a layer. The music is upbeat (and not terrible). The geisha mural on the back wall is splashed on in vivid colours. Chefs are from all nations and seem genuinely pally with each other, rather than disquietingly deferential. So far, so modern. And, oh yes, they’re also gleefully armed with blowtorches. These are put to use in several of the dishes, such as the sensational carpaccio of butterfish with foie gras. Normally, I’d be thinking what you’re thinking: nooooo. Because serving foie gras as sushi usually means a restaurant is pitching at the worst kind of crowd (that is, ostentatious philistines), the sort of people none of us want to have dinner next to. But here, for once, I’ll let it go, because it actually works. 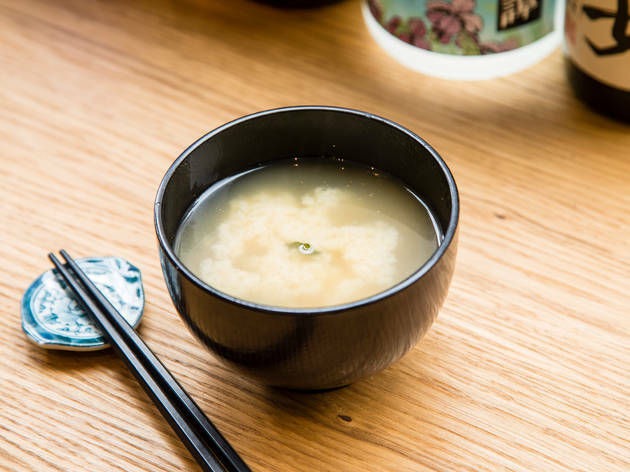 The controversial goose liver is used with restraint: morsels the size of corn kernels are placed over thick slices of silky, milky-white fish, before being generously seasoned, then given a flash of flame-grilling. Rich and moreish, it also came cut through with tendrils of cress, tiny edible pansies and lotus root crisps. Equally brilliant was a little veggie two-piece: one side braised burdock root (like a woody, savoury carrot), which came fragrant with salt, sesame and soy, the other a mound of sweet, nicely-chewy shiitake mushrooms. 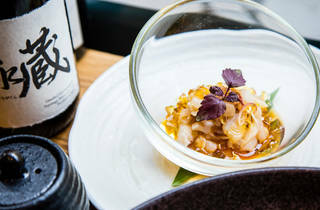 Both dishes appear on the excellent-value set menu (£35 for six courses and a glass of sake). Unfortunately, so did the sole misfire of the night: slivers of razor clam overwhelmed by red onion and billowing smoke. I don’t care how much get-your-phone-out drama a dish has (it arrived under a smoke-filled glass cloche), it still shouldn’t taste like a bonfire. So take the à la carte and skip it. Happily, the rest of the show dazzles: the sashimi was outstanding, particularly the sweet shrimp and some magnificently silky ōtoro (aka pink fatty tuna). There was more good tuna in a modish carpaccio, artfully decorated with blobs of tangy, citrussy, chilli-spiked ponzu jelly and wisps of coriander leaves. 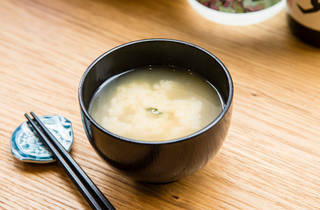 Even the miso was great. 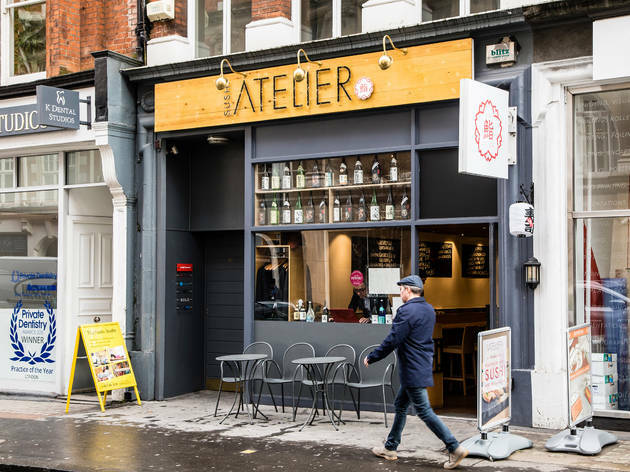 Sushi Atelier is small but lovely. You know what they say: good things come in… never mind. 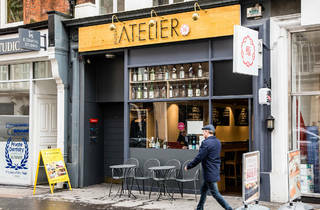 Meal for two with drinks and service: around £105. Sushi and sashimi is as obsession, I’m not going to lie, and I think this place has the perfect balance of creativity and keeping it simple. 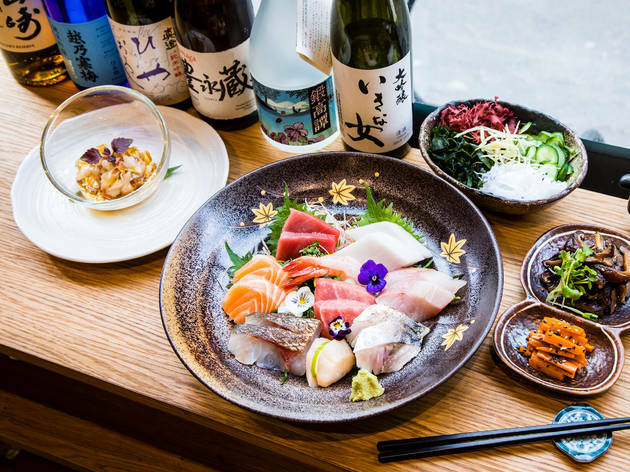 If you’re not quite sure with what to get, the omakase is always a good shout as it’s a selection of sushi/ sashimi chosen by the chef and is usually what is in season. The seafood here is fresh and garnished with well balanced flavours and textures. We were given an amuse bouche to start, a cherry tomato which was like a toffee apple, encased in a crunchy caramelisation. As strange as it sounds, the sweetness really balanced out the acidity in the tomato; however, it may not be everyone’s cup of tea. The razor clam was a surprise, done so creatively whilst never overpowering the freshness of the razor clam. The other surprise was the steamed tofu, it was so light and smooth; which actually made it seem more like a dessert due to the sweetness brought by the walnut biscuit. The red bean dorayaki was a little small in my opinion and wasn’t as strong as the other dishes. 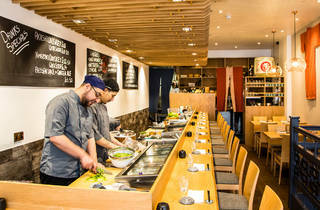 Overall the service here is attentive, quick, enthusiastic; the atmosphere a little NYC, and the food a refreshing balance of simple old school charm and new school creativity. Tip: sit at the bar so you get to watch all the delicious creations being made. Good For: quick meal, date night, small groups, something different, business dinner.